Following the rumoured Borderlands 3 release date leak a few days ago, a new leak has just surfaced online showing the PS4 cover art of the upcoming Borderlands 3. The new leak was shared by Wario64 on Twitter showing the three different Borderlands 3 editions. 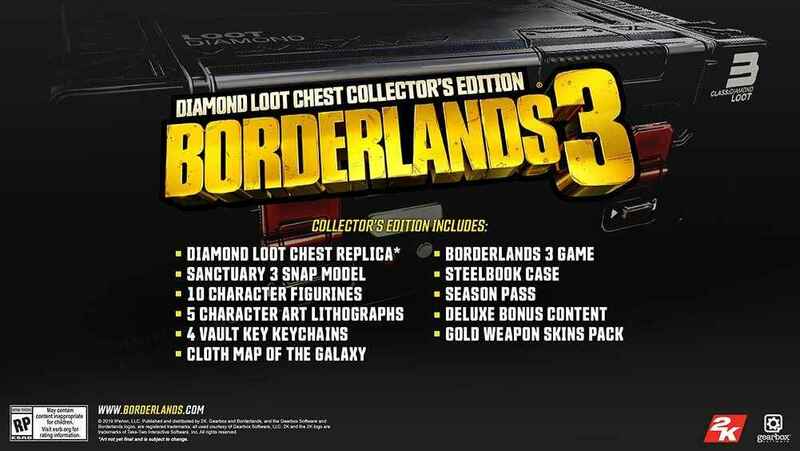 According to the leaked Borderlands 3 PS4 cover art, there will be four editions of the game – the Borderlands 3 Standard Edition, Borderlands 3 Deluxe Edition, Borderlands 3 Super Deluxe Edition, and Borderlands 3 Diamond Loot Chest Collector’s Edition.